These are lovely and exactly what I was looking for. The largest one is much larger than I expected and I didn’t realize they came with their own white candles which was nice. Uttermost's Candleholders Combine Premium Quality Materials With Unique High-style Design. With The Advanced Product Engineering And Packaging Reinforcement, Uttermost Maintains Some Of The Lowest Damage Rates In The Industry. Each Product Is Designed, Manufactured And Packaged With Shipping In Mind. Aged Black Curved Metal With Silver Highlights And Distressed White Candles. Sizes: Sm-7x7x5, Med-10x10x5, Lg-13x13x5 Aged Black Curved Metal With Silver Highlights And Distressed White Candles. Uttermost does it again! I have seen variations of these candleholders on several home decor sites. But they pale in comparison. 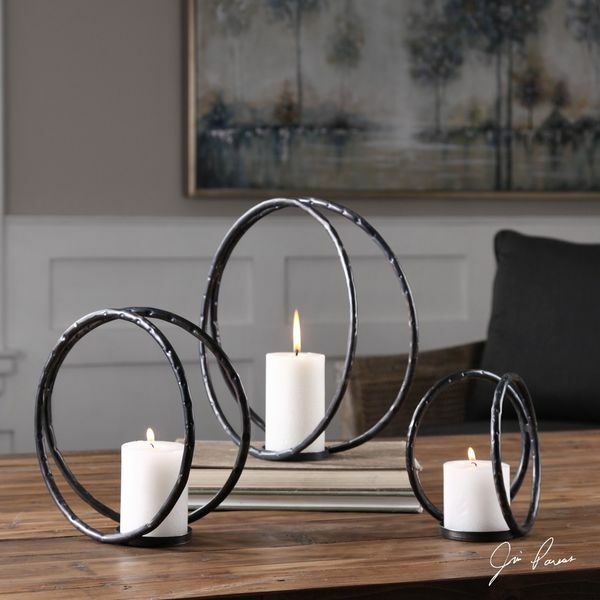 These artfully curved candleholders are well-made with a rustic simplicity that makes any space look elegant. I receive many compliments on them. I love these candle Holders. They are unique and beautiful! I am so happy with this product!!! It's made very well and it was exactly what I was looking for. It may be a 'tad' bit on the pricey side, but I have searched for so long, I was willing to pay the price. That said, I am not disappointed. It's a great piece!